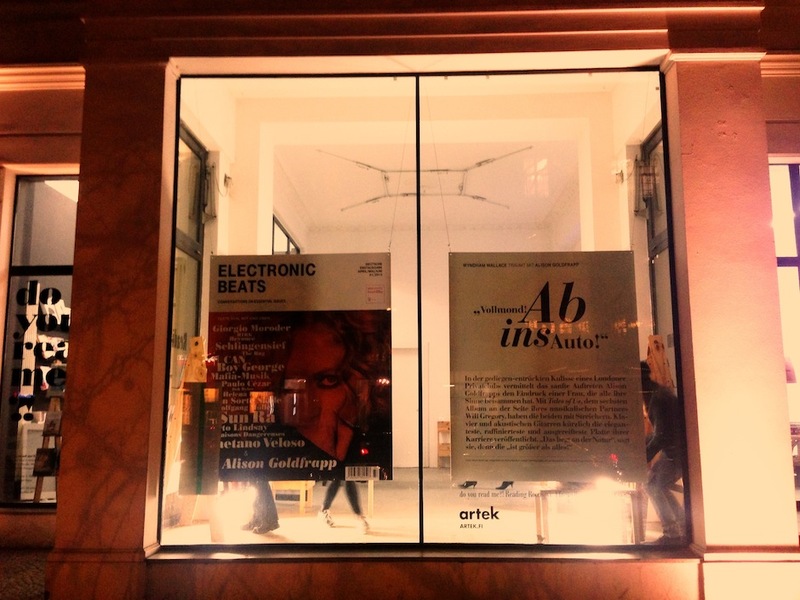 The Spring 2014 edition of <i>Electronic Beats Magazine</i> is out! Despite Berlin’s mild winter this 2014, the Nordic sun was not enough for Electronic Beats Magazine to stay put. And why should we? Intrinsic to presenting the oral history of electronic music and culture is travel, and there is no soundsystem too far flung or strand of dance music too obscure to experience live and direct. This also ties into another important piece of information, which is the launch of our new German language issue, available from March 22 at newsstands all over Germany, Austria and Switzerland for 4.50 EUR. The German issue is identical to the English issue in every way except for language, and proudly flies the flag of serious corporate publishing dedicated to an ideal of collectable and sustainable print media. For die-hard EB readers we recommend reading both at the same time… just cus. Anyhow, in January we packed our bags and flew to Rio de Janeiro to see how the city was coping with protests surrounding the preparation for year’s World Cup. In Brazil, currently South America’s largest and fastest growing economy, various cultural protagonists, from Paulo Cézar and Caetano Veloso to artist Renata Lucas and leftist watchdogs Mídia Ninja, were eager to voice their opinions about gentrification in the country’s various favelas and the bigger picture of the country’s social and political “progress”. In another hemisphere which might as well have been another planet, the Sun Ra Arkestra’s band leader Marshall Allen spoke to editor-in-chief Max Dax and saxophonist Andre Vida about futurism and how their Philadelphia commune (formerly run by Sun Ra himself) encouraged a stringent but far-out approach to sound. However, as Allen explains, free jazz was never about doing whatever you want, but rather following cosmic rules—if for no other reason than to avoid Sun Ra’s famous punishments. Speaking of punishment: Wyndham Wallace spoke with Alison Goldfrapp in London about her taste for nuns and recording in bucolic seclusion. Not to be missed. – A.J. Samuels and journalist/photographer Francesco Sbano travel to southern Italian region of Calabria to talk to the members of the ’Ndrangheta mafia organization about the hypnotic, droning and highly codified rituals of the tarantella. – Danish duo Den Sorte Skole discuss their critically acclaimed but utterly uneconomical habit of using thousands of samples from music around the world . . . without clearing a single one. – Giorgio Moroder tells us about working together with Daft Punk and recomposing the film music for Fritz Lang’s legendary film Metropolis. – Boy George elucidates his ongoing obsession with style icon Bob Dylan. In our recommendation section, bass music experimentalist Lotic talks about Houston pride and Beyoncé’s recent video album; The Bug sings the praises of Ekoplekz; Swans’ Christoph Hahn contextualizes Automat’s latest Berlin-themed release; David Strauss deconstructs De La Soul’s Valentine’s Day back catalogue giveaway; Daniel Jones celebrates the return of HTRK, and much, much more. So sit back, turn off your electronic devices, take a deep breath and maybe your consciousness will follow. Surrounded by larger-than-life images of cover story Alison Goldfrapp, Telekom’s Head of International Music Marketing, Ralf Lülsdorf and EB editor-in-chief Max Dax teamed up with editors A.J. 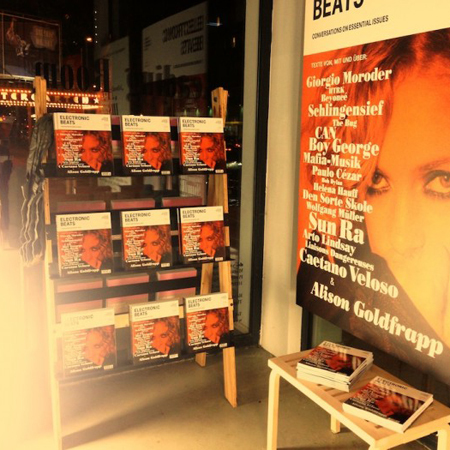 Samuels and Robert Defcon to discuss the Spring 2014 issue at the launch of the German language edition of Electronic Beats Magazine held in Berlin’s famed Do You Read Me? shop.